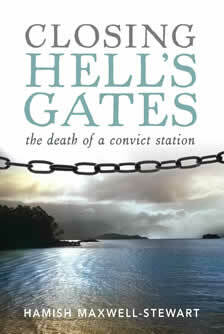 The main purpose of this website is to provide readers of Closing Hell’s Gates: The Death of a Convict Station with access to the full list of references. In the published book references are only provided for quoted material. The full list of material cited can be accessed by clicking on each of the chapter headings. In the rush to meet publication deadlines I embarrassingly left some very important people off the acknowledgments list. I would like to take the opportunity presented by this website to rectify this: acknowledgement addendum. I have also made available some of the images that did not make it into the book and to provide access to a selection of the datasets assembled as part of the research. These include my list of known prisoners who were at the penal settlement. I have no doubt that these lists are not comprehensive, but I hope that they are of some use to other researchers and to the descendants of transported convicts. You will also find the full text of “Macquarie Harbour”, the poem written by the prisoner John Thompson: original data. Finally I have included links to other sites that may be of some interest to readers of Closing Hell’s Gates interested in further research or in visiting Macquarie Harbour: list of useful websites. A photograph of a miniature pitsaw given to the settlement clerk, John Douglas, as a reward for his years of service at Macquarie Harbour. Reproduced here with the kind permission of the Tasmanian Museum and Art Gallery. A lintel originally from the New Penitentiary and now resting in the waters of the harbour. The penitentiary was blown up in the early 20th century. The local story is that the man responsible was an English mining engineer who was fed up with being told that it was the “bloody poms” who had run the infamous penal station. Two lintels can be seen at low tide. They are both carved with flowers and diamond patterns. Drawing by Prue Theobalds, December 2006.